Geosynthetics are one of the polymeric products which are usually made-up of polypropylene, polyester, and polyethylene. Such products maintain their properties while exposed to a harsh environment. Geosynthetics are highly used in various environmental activities such as filtration, and landfill and civil construction. Rising number of ongoing projects for enhancing civic amenities, growing transportation sector, and increasing demand for geosynthetics in hazardous and industrial waste are majorly driving the global geosynthetics market. Apart from these, rapid industrialization, rising number of environmental projects and huge infrastructure are also propelling demand in the global geosynthetic market. As per expert analysts, the global geosynthetics market registered an initial valuation of US$11.30 bn clocked in 2016. This growth is prophesized to occur at a promising CAGR of 9.1% during the forecast period from 2015 to 2023. The persistent demand for geosynthetics mostly comes from the construction of railway stations, airports, dams, bridges, and roads. The market is mainly segmented on the basis of product types and function. From the perspective of product types, the global geosynthetics market is divided into following segments – geogrids, geotextiles, geomembranes, and drainage composites. Among these products, growing demand for geogrids and geotextiles is expected to boost the global geosynthetics market in the coming years. Geotextiles segment is believed to showcase fantastic expansion in the next few years, especially during the mentioned forecast period - 2015 to 2023. This is mainly due to the rising uptake of geotextiles in the construction industry globally. This is also attributed to their excellent flexible and porous nature. Along with these, rising versatility of various construction projects are bolstering demand for geotextiles. Geomembranes is the another lucrative product segment to witness highest proliferation thanks to its high performability in various lining applications such as landfill and tank liners. In terms of function, the global geosynthetics market is bifurcated into segments such as drainage, separation, reinforcement, barriers, containment, protection, and erosion control. Of these, erosion control is expected to witness largest share due to the heavy usage of geosynthetics material among farmers in order to prevent soil erosion. Geographically, the global geosynthetics market is segmented into North America, the Middle East & Africa (MEA), Latin America, and Asia Pacific. 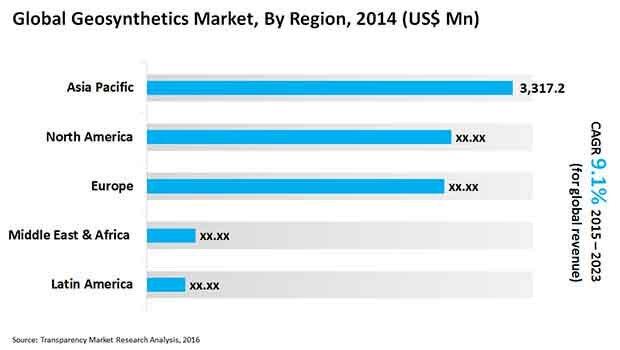 Out of these regions, Asia Pacific is expected to lead the global geosynthetics market till 2023. By 2023 end, this regional market is expected to contribute a lion’s share of 40.2%. This is because of the mushrooming urbanization and manufacturing industries in China. Other lucrative regional markets are the GCC and the ASEAN. Rapid infrastructural developments, and growing number of constructional projects are responsible for fueling the global geosynthetics market in these regions. On the other hand, in North America and Europe the demand for geosynthetics is modest. A competitive vendor landscape exists in this market thanks to the presence of innumerable players. Some of the prominent players operating in the global geosynthetics market are Low & Bonar PLC, GSE Environmental, NAUE Gmbh & Co, TenCate Geosynthetics, and Officine Maccaferri S.p.A. This report analyzes and forecasts the market for geosynthetics at the global and regional level. The market has been forecast based on volume (Mn Square Meters) and revenue (US$ Mn) from 2015 to 2023. The study includes drivers and restraints of the global geosynthetics market. It also covers the impact of these drivers and restraints on demand for geosynthetics during the forecast period. The report also highlights the opportunities in the geosynthetics market at the global and regional level. The report includes a detailed value chain analysis, which provides a comprehensive view of the global geosynthetics market. Porter’s Five Forces Model for the geosynthetics market has also been included to help understand the competitive landscape in the market. The study encompasses market attractiveness analysis, wherein products are benchmarked based on their market size, growth rate, and general attractiveness. The study provides a decisive view of the global geosynthetics market by segmenting it in terms of products and functions. These segments have been analyzed based on present and future trends. Regional segmentation includes current and forecast demand for North America, Europe, Asia Pacific, Latin America, and Middle East & Africa. The report also covers demand for individual products and end-user segments in all regions. The study includes profiles of major companies operating in the global geosynthetics market. Key players profiled in the report include Low & Bonar PLC, AVINTIV Inc., Officine Maccaferri S.p.A., NAUE GmbH & Co. KG, Agru America, Inc., Propex Operating Company, LLC, TenCate Geosynthetics, GSE Environmental, Inc., Tenax Corporation, Tensar International Corporation. Market players are profiled in terms of attributes such as company overview, financial overview, business strategies, and recent developments. The report provides the estimated market size of geosynthetics for 2015 and forecast for the next eight years. The global market size of geosynthetics is provided in terms of both volume and revenue. Market volume is defined in Mn Square Meters, while market revenue is in US$ Mn. Market numbers are estimated based on key product segments and end-user segments of geosynthetics. Market size and forecast for each major product and end-user is provided in terms of global and regional markets. Secondary research sources that are typically referred to include, but are not limited to company websites, annual reports, financial reports, broker reports, investor presentations, SEC filings, Plastemart magazine, TPE magazine, internal and external proprietary databases, and relevant patent and regulatory databases such as ICIS, Hoover’s, oneSOURCE, Factiva, and Bloomberg, national government documents, statistical databases, trade journals, market reports, news articles, press releases, and webcasts specific to companies operating in the market.